Failing to control AQAP (al-Qaeda in the Arabian Peninsula) in the past, the Yemeni military is now faced with a more serious conflict. Our contributing photojournalist in Yemen, Saleh Maglam, covered the Yemeni Revolution and is now able to report on the current conflict at great personal risk. Conflict photography whether in South Africa during apartheid, Syria, Nigeria, Dafur, Bosnia, Vietnam or any number of similar conflict areas can propel an unknown photojournalist to instant fame or result in serious injury or death. 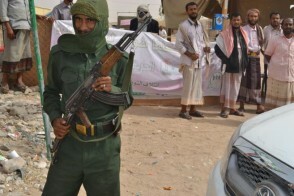 The al-Qaeda presence in Yemen has spread from Shabwa province to additional areas as the Yemeni military is trying to eliminate the threat. The American embassy is now closed due to security issues. While the course and outcome of this conflict is unknown, the suffering of civilians and children is universal in all situations of this kind. It is this sensitivity to humanity which Saleh Maglam presents in his photographs.